Winter has disappeared in most of Texas and spring is bursting upon us. 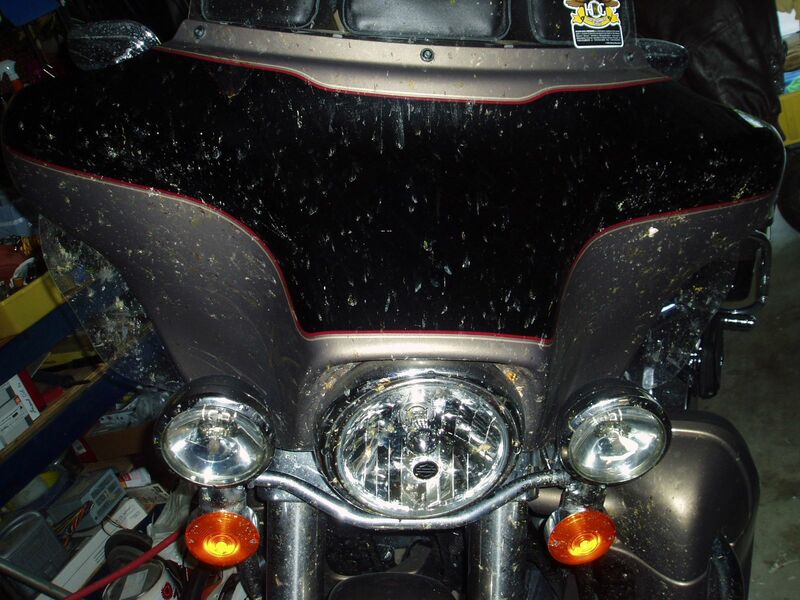 It's the best riding time, but there's one little problem: bugs, butterflies, and bees are in the air and certain to hit your bike and/or you while you cruise down the highway. Flying bugs and butterflies aren't much of a problem unless you're doing about 70mph and happen to hit a June bug with your face. I once had a June bug hit me on the cheek and I thought I'd been shot with a 22 caliber bullet. That's only happen twice in many miles on the road so I don't worry too much about it. Cleaning that mess on your fairing is another matter. A few years back I was in Alpine, Texas and a fellow rider saw my bike and said he could help clean that mess. He sprayed some liquid on the bugs and "magic" it worked! The liquid started boiling away the bug mess. I asked what special spray that was and he said it was just hydrogen peroxide from his bathroom vanity. Makes sense since bugs are mostly protein the hydrogen peroxide starts to work right away. Another modern miracle! Bugs are a nuisance, but bees sting! If you're allergic you'd better carry your antidote. My wife and I were once on a narrow highway in the mountains of Mexico somewhere near San Miguel de Allende when I had a bee fly up my left sleeve and sting me on the forearm. I couldn't pull over and I couldn't take my hand off the throttle so I just hit my arm on my leg and swung it around to get that bee out. I don't know if I was successful, but after a little while I could feel the sting in my arm and the pain radiating up my arm. It wasn't very painful it was just the thought that the sting was traveling up my arm, soon to reach my heart, and that had me in a panic. I didn't die and the pain went away, but since then I always carry one of those Benadryl spot treatment sticks and pills with me just in case. Spring - a beautiful time of year. categories "Harley Davidson Motorcycle Touring", "Wildlife Refuge"
Why do you ride a motorcycle?